Aṣṭāvakrāsana, the pose dedicated to the sage of Aṣṭāvakra or Eight-Angled Pose is our peak pose for this power pose series. Parsva bakasana, eka pada śīrṣāsana, and paripūrna nāvāsana prepare us for this posture, but there’s more to the pose than meets the eye. Aṣṭāvakra was wise man and a scholar, but because of a curse, he was born with a crippled, crooked body and needed a cane to walk. It’s the classic story of “don’t judge a book by its cover”. He entered the king’s court to join in the discussions about the Vedas, but because of his outward appearance he was discounted and ridiculed. Aṣṭāvakra humbled the king and his court, pointing out that they could only see the surface, not the essence or soul of a person. At this, the king realized his error and became Aṣṭāvakra’s student. The pose dedicated to the sage is challenging, but don’t let the end pose or the appearance of it define your journey. Everyone’s yoga journey, as well as their poses will be different and personal. It’s the heart of the yogi, the essence or the soul that really matters. The pose is a reminder to not be guided by the outward appearance of people, rough and worn or bright and shiny. What you see on the outside does not define a person. Heart, compassion, and integrity are much better indicators of a person’s true character. As you practice the stages of this pose, remember that it’s what’s inside that’s important, the external pose is just a test of our character and how we meet challenge. Option 1 – Ankles crossed. Starting from Eka Pada Śīrṣāsana Prep or leg behind the shoulder, cross the ankles. 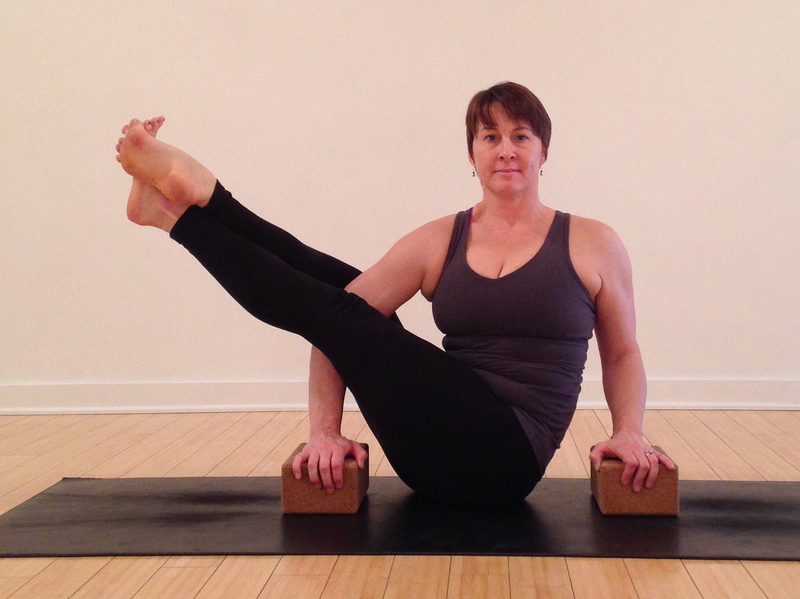 With hands on blocks next to the hips, hug the elbows toward the body, maintaining a caturanga shape in the arms. Twist the torso, opening the heart, reaching the collar bones and shoulder heads broad. Option 2 – Extend the legs. Begin to extend the legs, sandwiching the tricep between the thighs. Squeeze the tricep as you reach the feet away. Press through the balls of the feet. Continue to twist the torso. Be sure to keep the thighs above the elbow. If this is not available, continue to work on the opening of the hip. Option 3 – Lift from the floor. Press firmly into the blocks and shift the heart forward. Elbows will bend at 90* as they hug to the midline of the body without collapse. Hold the tricep firmly with the thighs, reach the legs and feet long out to the side. Option 4 – Aṣṭāvakrāsana. When the wrists are ready to support the body, remove the blocks and place the hands firmly on the ground. Press into the floor to lift as the heart is pulled forward. Lift the belly away from floor, making the pose buoyant. 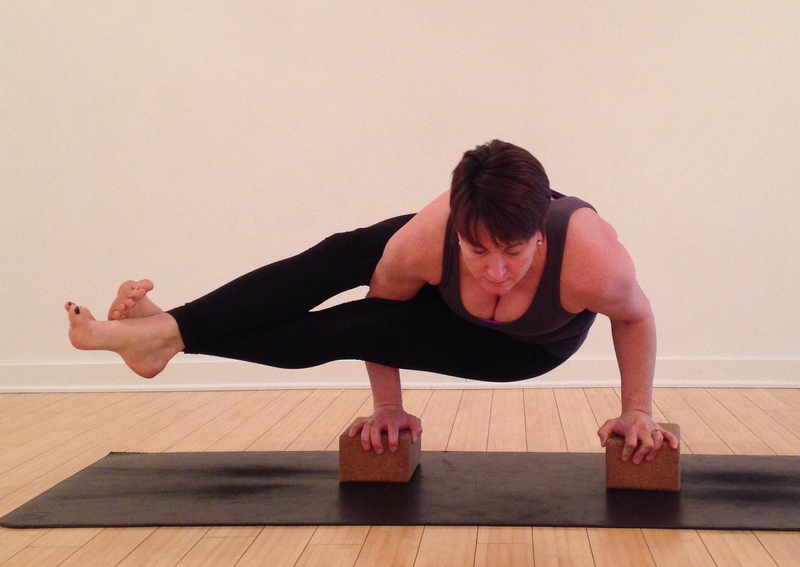 When you are able to deconstruct this pose, you may find that it can be easier than it looks. Open your heart to the possibility that the pose is difficult because that is our perception and predetermination. In time and with practice, it all comes together. Follow this weekly challenge @suzannewrightyoga on Instagram or at Suzanne Wright Yoga on Facebook. If you post your pictures or share about your experience be sure to tag #PowerPose and @suzannewrightyoga.